Summary:Caroline is at a crossroads. Her grandmother is sick, maybe dying. Like the rest of her family, Caroline's been at Gram's bedside since her stroke. With the pressure building, all Caroline wants to do is escape--both her family and the reality of Gram's failing health. So when Caroline's best friend offers to take her to a party one fateful Friday night, she must choose: stay by Gram's side, or go to the party and live her life. Though there are two distinct ways for her fate to unfold, there is only one happy ending..
My Thoughts: While this one has got a lot of really positive reviews, it was just okay for me. We are introduced to Caroline who has some tough decisions to make. While her grandmother is sick, she must choose to either stay by her side or go to a party with a friend. And her decision changes everything. We see things from two different perspectives, on what could happen for Caroline, depending on which choice she makes and how her actions further change the course of her life. This one had an interesting concept and I found it intriguing. I liked seeing how she could date two completely different boys and how how she would be with her family in each reality. But, I also found myself having a problem connecting to either Caroline. I just didn’t like switching back and forth, and I usually have a problem with this in novels. I am hoping to read more like this so I can see the different ways authors can do this. Just Like Fate was just okay for me. I just didn’t feel like I could connect with the characters or the realities. Make sure to give it a chance, because it does have a lot of 4-5 star ratings. It just wasn’t the perfect novel for me I guess. Overall: It was alright. I can see why so many people will like this! It examines our choices and how they can change our lives! I’m one of those people who constantly think about that so I can see the beauty of this one. 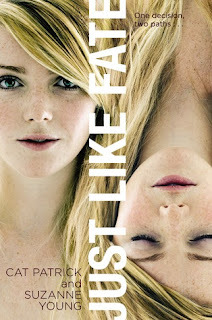 Cover: Like it. It shows how Caroline’s life can be split. Neat. I like the premise for this one but it was so similar to Pivot Point and yet the characters weren't as engaging so this was not a winner for me.